Tickets available NOW from the local Londis Castle Store on the Green and from the school office at St John’s Primary School. Places are limited and we expect the event to sell out so don’t hang about to get your tickets quickly. 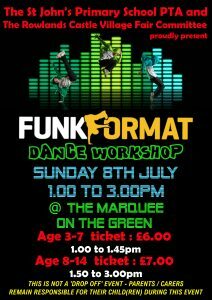 Come and join us for an exciting afternoon of STREET DANCE! In the workshops, children will learn the freshest street dance moves ranging from Hip-Hop foundations to Breakin’ (Breakdancing). Whether you are a total beginner or have some skills already, join us for a fun filled session – All levels & abilities welcome. The event is open to all children and there will be two sessions running. 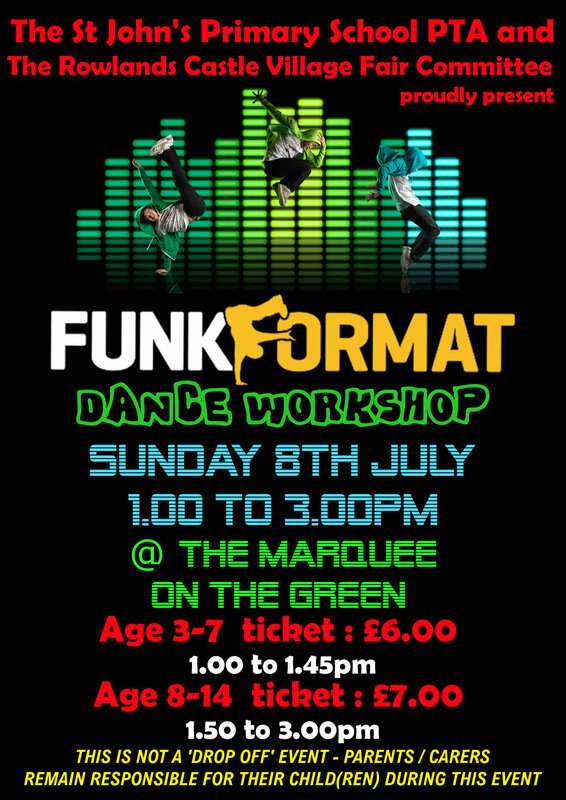 The workshops are being run by FUNK FORMAT who are a local not for profit organisation and run a lot of classes in the local area. This is not a ‘drop off’ event – parents/carers remain responsible for their child(ren) during this event. Therefore the RCVF Bar on the Green will be reopen for thirsty parents & spectators. Other refreshments to be available too. There will also be activities for any children not taking part/waiting for their session. Please wear suitable footwear for movement, such as trainers. Also bring smiles & heaps of energy! A big thank you to our friends on the Rowlands Castle Village Fair Committee have helped fund this event and have also kindly let us use the marquee the day after the Village Fair for this special one off event. Another warm thank you to the Londis Castle Stores have also contributed towards the running of this event.